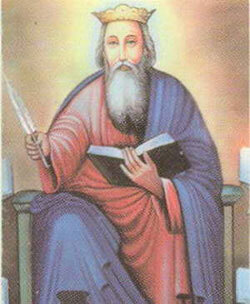 St. Paternus.The first 5th century saint. He followed his father’s path by becoming a hermit in Wales. He founded the monastery at the great church of Paternus, and became a bishop of that region. He was known for his preaching, charity and mortifications. Scholars believe his story is an amalgam. His feast day is April 16. 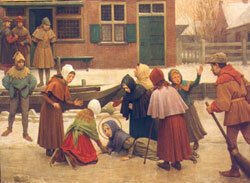 St. Lydwine is the patroness of sickness Lydwine of Schiedam was born at Schiedam, Holland, one of nine children of a working man. After an injury in her youth, she became bedridden and suffered the rest of her life from various illnesses and diseases. She experienced mystical gifts, including supernatural visions of heaven, hell, purgatory, apparitions of Christ, and the stigmata. Thomas a Kempis wrote a biography of her. She was canonized Pope Leo XIII in 1890. Lydwine suffered a fall while ice skating in 1396, when a friend collided with her and caused her to break a rib on the right side. From this injury, she never recovered. An abscess formed inside her body which later burst and caused Lydwine extreme suffering. Eventually, she was to suffer a series of mysterious illnesses which in retrospect seemed to be from the hands of God. Lydwine heroically accepted her plight as the will of God and offered up her sufferings for the sins of humanity. Some of the illnesses which affected Lydwine were headaches, vomiting, fever, thirst, bedsores, toothaches, spasms of the muscles, blindness, neuritis and the stigmata. Her feast day is April 14. Martin I lay too sick to fight on a couch in front of the altar when the soldiers burst into the Lateran basilica. He had come to the church when he heard the soldiers had landed. But the thought of kidnapping a sick pope from the house of God didn’t stop the soldiers from grabbing him and hustling him down to their ship. 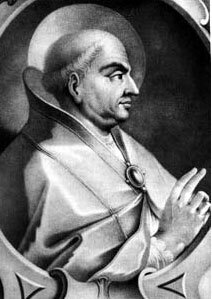 Elected pope in 649, Martin I had gotten in trouble for refusing to condone silence in the face of wrong. At that time there existed a popular heresy that held that Christ didn’t have a human will, only a divine will. The emperor had issued an edict that didn’t support Monothelism (as it was known) directly, but simply commanded that no one could discuss Jesus’ will at all. From there he was exiled to the Crimea where he suffered from the famine of the land as well as the roughness of the land and its people. But hardest to take was the fact that the pope found himself friendless. His letters tell how his own church had deserted him and his friends had forgotten him. They wouldn’t even send him oil or corn to live off of. Julius whose feast day is April 12th. Julius was the son of a Roman named Rusticus. 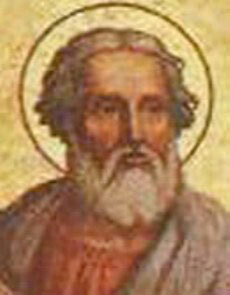 He was elected Pope to succeed Pope St. Mark on February 6, 337. Julius was soon involved in the Arian controversy when Eusebius of Nicomedia opposed the return of Athanasius to the See of Alexandria in 338. Eusebius and his followers elected George, whereupon the Arians elected Pistus. Julius convened a synod in Rome in 340 or 341 that neither group attended, and in a letter to the Eusebian bishops, Julius declared that Athanasius was the rightful bishop of Alexandria and reinstated him. The matter was not finally settled until the Council of Sardica (Sofia), summoned by emperors Constans and Constantius in 342 or 343, declared Julius’ action correct and that any deposed bishop had the right of appeal to the Pope in Rome. Julius built several basilicas and churches in Rome and died there on April 12. Foundress of the Sisters of Charity, the Grey Nuns of Canada. 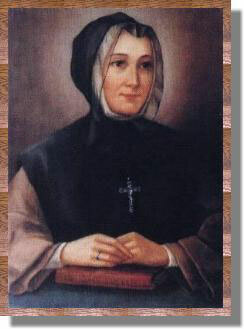 St. Marguerite D’Youville was born at Varennes, Quebec, on October 15, Marie Marguerite Dufrost de La Jemmerais. She studied under the Ursulines, married Francois D’Youville in 1722, and became a widow in 1730. She worked to support herself and her three children, devoted much of her time to the Confraternity of the Holy Family in charitable activities. In 1737, with three companions, she founded the Grey Nuns when they took their initial vows; a formal declaration took place in 1745. 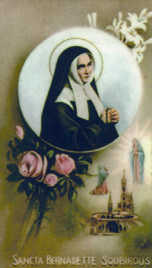 Two years later she was appointed Directress of the General Hospital in Montreal, which was taken over by the Grey Nuns, and had the rule of the Grey Nuns, with Marguerite as Superior, confirmed by Bishop of Pontbriand of Quebec in 1755. She died in Montreal on December 23, and since her death, the Grey Nuns have established schools, hospitals, and orphanages throughout Canada, the United States, Africa, and South America, and are especially known for their work among the Eskimos. She was beatified by Pope John XXIII in 1959 and canonized in 1990 by Pope John Paul II. Michael de Sanctis was born in Catalonia, Spain around 1591. At the age of six he informed his parents that he was going to be a monk. Moreover, he imitated St. Francis of Assisi to such a great extent that he had to be restrained. After the death of his parents, Michael served as an apprentice to a merchant. However, he continued to lead a life of exemplary fervor and devotion, and in 1603, he joined the Trinitarian Friars at Barcelona, taking his vows at St. Lambert’s monastery in Saragosa in 1607. Shortly thereafter, Michael expressed a desire to join the reformed group of Trinitarians and was given permission to do so. He went to the Novitiate at Madrid and, after studies at Seville and Salamanca, he was ordained a priest and twice served as Superior of the house in Valladolid. 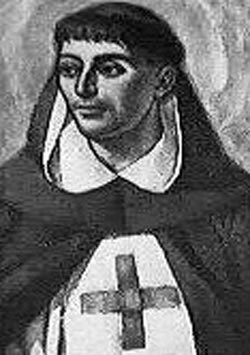 His confreres considered him to be a saint, especially because of his devotion to the Most Blessed Sacrament and his ecstacies during Mass. After his death at the age of thirty-five on April 10, 1625 many miracles were attributed to him. He was canonized in 1862 by Pope Pius IX. 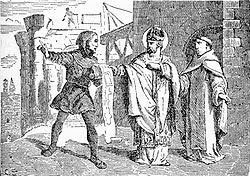 St. Michael de Sanctis is noted in the Roman Martyrology as being “remarkable for innocence of life, wonderful penitence, and love for God.” He seemed from his earliest years to have been selected for a life of great holiness, and he never wavered in his great love of God or his vocation. As our young people look for direction in a world that seems not to care, St. Michael stands out as worthy of imitation as well as of the prayers of both young and old alike. His feast day is April 10. Also known as Waltrude or Waudru, she was the daughter of Saints Walbert and Bertilia and sister of St. Aldegunus of Maubeuge. 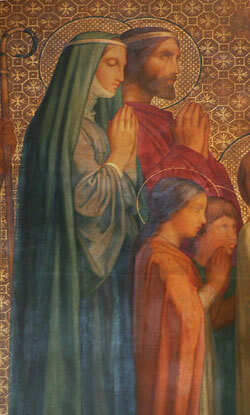 Marrying St. Vincent Madelgarius, she became the mother of saints Landericus, Madalberta, Adeltrudis, and Dentelin. When her husband chose to become a monk about 643 in the monastery of Hautrnont, France, he had founded, she established a convent at Chateaulieu, around which grew up the town of Mons, Belgium. 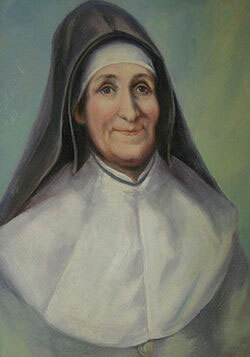 St. Julie (Julia) Billiart was born in 1751 and died in 1816. As a child, playing “school” was Julie’s favorite game. When she was sixteen, to help support her family, she began to teach “for real”. She sat on a haystack during the noon recess and told the biblical parables to the workers. Julie carried on this mission of teaching throughout her life, and the Congregation she founded continues her work.